• In the back right hand corner of the sanctuary we have removed a pew and created a secure area for babies and their parents. There is room for babies to get on the carpeted floor and explore and play. There is a pew for the parents to be fully able to participate in worship. Of course, parents are welcome to sit anywhere in the sanctuary, but this space has been created especially for them. • Woodlawn is a Breastfeeding friendly area. Feel free to feed your little one during worship, or any of our programs. 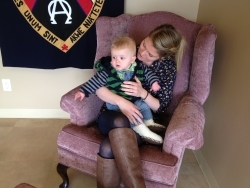 • We have put a rocking chair in the new entrance if parents require a little more privacy…. but still want to hear the worship. • There is a family washroom with change table. • Downstairs, adjacent to the hall, is a stocked nursery room. There are toys, a pack and play crib, chairs etc…. this room is NOT staffed but available for parents to use with their young ones. What does Woodlawn United offer for 2-4 year olds? 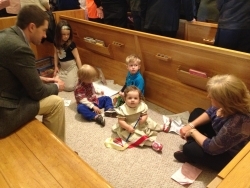 The 2 & 4 year olds have their own classroom where they do crafts, activities and explore their spiritually through play. We have a wonderful team of teachers and parents who make this classroom a fun place to learn about God!